Nominate up to 10 blogs which show great attitude and/or gratitude! Tami at Straight Toque With Tami, Eh? OK, yes I went over my limit, but I like all these blogs and I wanted these blogger to know that I read and like them, even if I don’t comment a lot. Posted by Belleza on March 22, 2009 in Uncategorized and tagged Award, Link, Pictures. Hi Bella, congrats on your award! I just love the thought of spreading the spirit of sisterhood. The award was just passed to me by JonJon. Thank you for that :). Best wishes. Thank you Bella!!!! !I just managed to post about it. 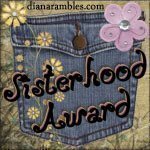 Feel free to visit it < HREF="http://jonjon-journeys.blogspot.com/2009/03/sisterhood-award.html" REL="nofollow"> here<>.Have a wonderful weekend ya! Hi, Bella! Congrats on the award. And thanks so much for passing it on to me! I’m very flattered and honored, and I’ll be doing a blog post about it right away. Thanks Bella. I knew that I f I whined enough, someone would finally throw me a bone! 🙂I love your blog as well. DeSeRt RoSe, I normally go down the list of blogs I follow, cause I’m lazy and I can just copy and paste to get the link, and as I was picking out the blogs I wanted I suddenly realized I had more then 10. Oh well, I was just following your stellar example. Crap..ok that comment above is from Kat from 3 Bedroom Bungalow. I am just too lazy to go change accounts right now. I am so excited! Thank you so much!! I’ll blog about it this afternoon. Wow! You’ve made my day! Congrats on your award 🙂 you see how it’s so hard to keep to the limit 😉 Now i know I’m not alone! Thank you so much, Bella! You have given me something to smile about tonight! I really appreciate it. Peggy gave me this award earlier also. I will add your name to my sidebar with the award. Thank you again. Thank you Bella, I am touched you thought of me for this loevly award!